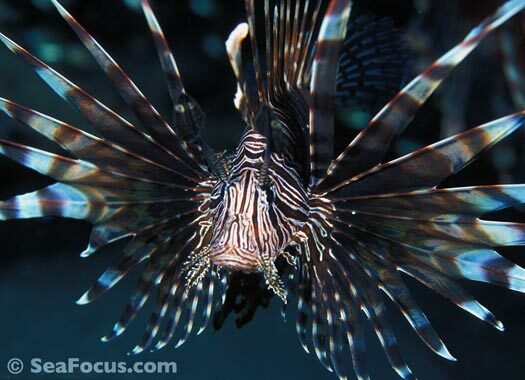 Lionfish are closely related to scorpionfish and stonefish but are distinguished by how incredibly beautiful they are. 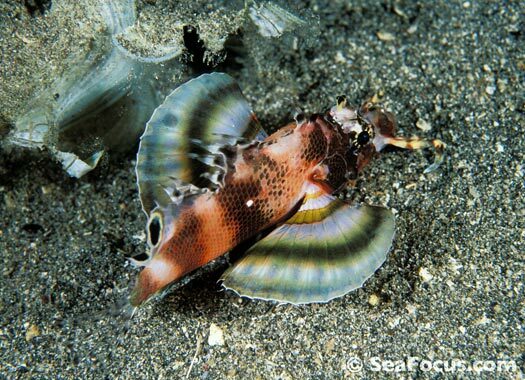 Elegant and graceful, they can grow up to fifteen inches long but if they spread their pectoral fins can look much larger. 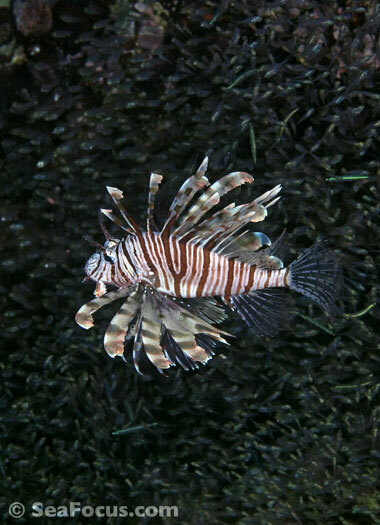 Lionfish float fearlessly around the reef as they are also one of the most venomous residents there. 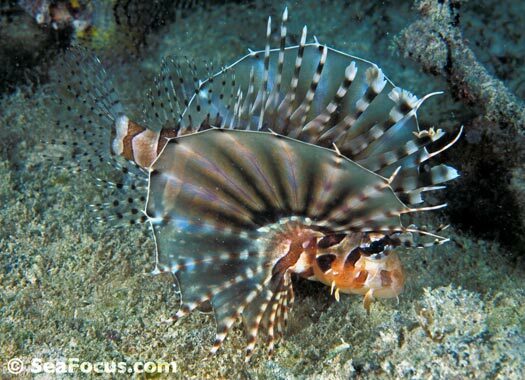 Their long, slender spines have small venom glands embedded at the base. 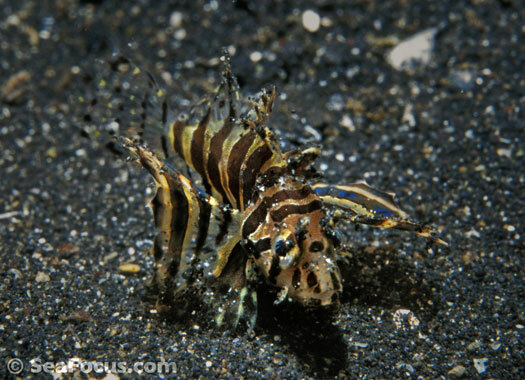 If the spine is pressed, it triggers a release of venom, which is then delivered into whatever pressed on it. 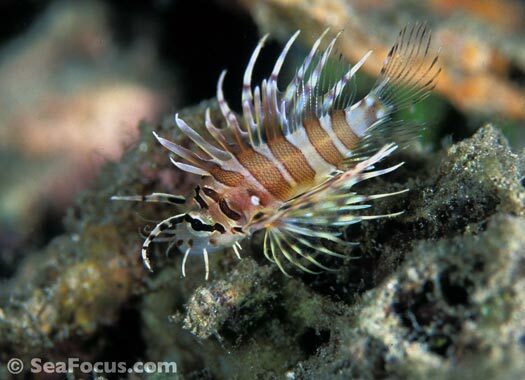 However, lionfish only attack when they are harassed. 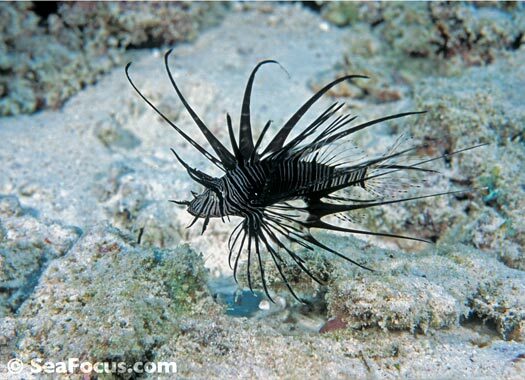 Mostly, their long feathery fins and bristling spines are used as camouflage. Nestled down amongst corals or seagrass they can be hard to spot and it’s usually only if you disturb one that you realise they are there, no doubt hanging about waiting for a chance to feed on something. 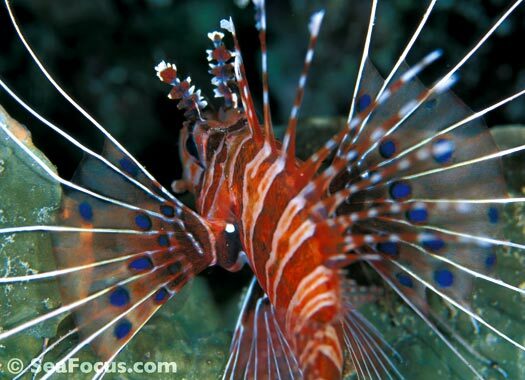 They eat any smaller fish and crustaceans they can catch. Chasing their prey uses a lot of energy so they consume a large amount to compensate for this loss. 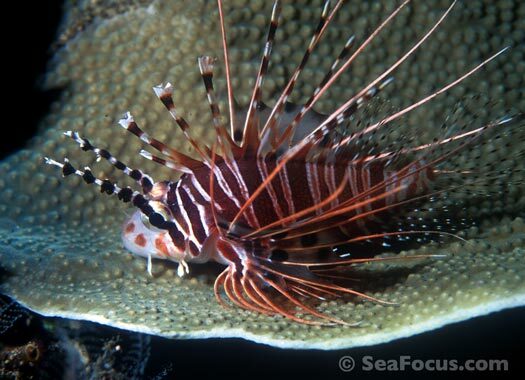 Still, like all predators, lionfish have an instinctive awareness that causes them to give up the chase if it seems likely to use more energy than it is worth– and this action explains the clever adaptation to working in tandem with divers and their torch beams. 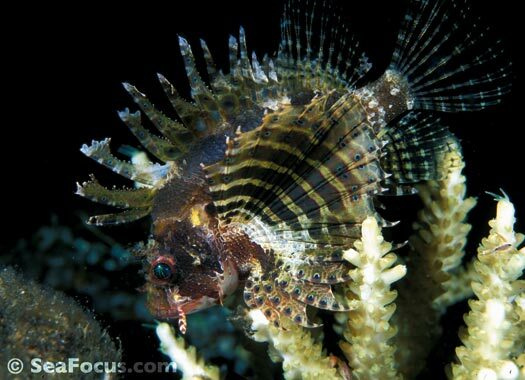 If you dive at night, it seems that any fish who are still out and about on the reef are somewhat disoriented, temporarily blinded by torch lights or startled into stillness. 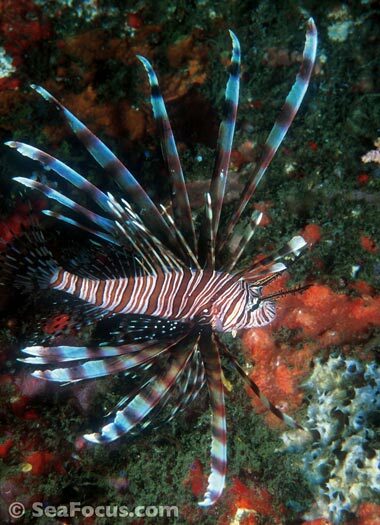 But not lionfish. 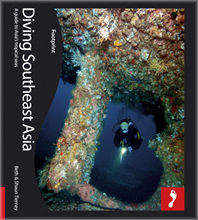 These fish have learnt to take advantage of divers with lights, sneaking up to swallow smaller, bewildered fish whole. 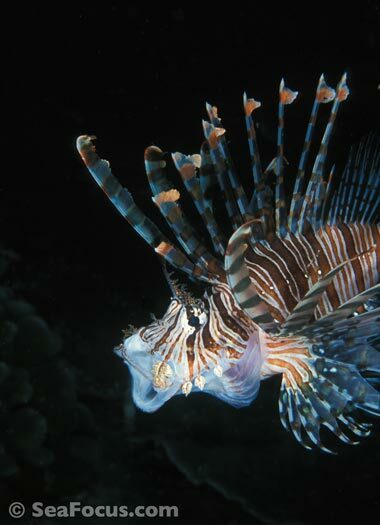 Lionfish are now regarded as an invasive species and are found in Caribbean and Atlantic and waters, which is not their natural environment. 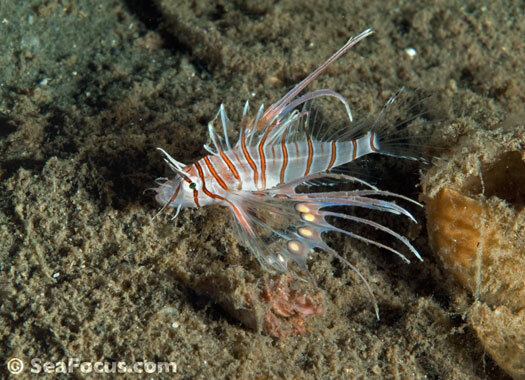 Early morning dives are always a good time to see marine species hunting for breakfast. 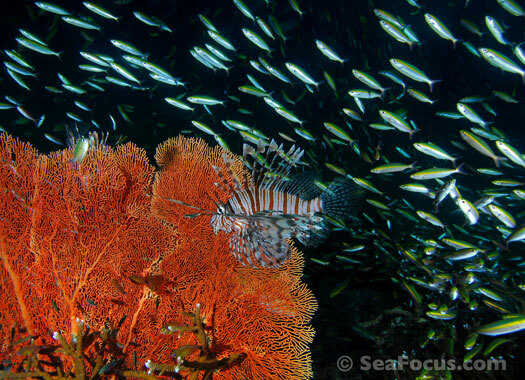 On this site, we entered over some small coral bommies then descended to a patch of really good staghorn corals surrounded by a white sand seabed. One section had attracted an astounding amount of feeding fish, from baitfish up to jacks and tuna. All the predators were chasing after each other. 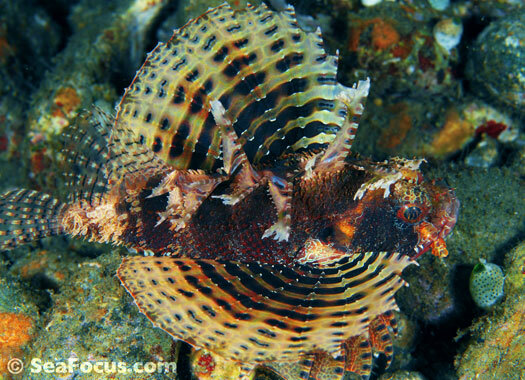 This one fan had grown into a cross shape and at least a dozen lionfish nestled in it’s corners, swooping on and off to feed on smaller fish that were trying to use the fan for protection.